Peterson Real Fyre Charred Series Gas Logs reflect the glowing depth and fiery heart of a long burning fire. Real Fyre artisans work from actual wood samples to carefully recreate the intricate bark detail and natural coloration of deeply charred wood. Gas fireplace logs are convenient and easy to use for most gas fireplaces. The beautiful display and flame presentation of this Real Fyre Charred Wood gas log set is ideal for creating those magic moments and memories. This Peterson Real Fyre gas log set includes: Ceramic Refractory Vented Gas Logs, ANSI Certified Vented Burner with Pre-Assembled Valve and Regulator, Piezo Ignitor, Custom Grate, Connector Kit, Glowing Embers, Vermiculite, Burner Clips, and Damper Clamp. The Peterson Real Fyre Vented ANSI Certified G46 Burner features a T-shaped burner pipe. The T-shaped burner contains a large pipe in the center of the pan and a smaller pipe that runs through the ember bed. This allows the flames to not only dance through the center of your log set, but through the center of the ember bed, which gives you a more realistic flame pattern. This burner also contains a patented system that features a hidden factory installed control valve, and piezo ignition at the rear of the burner. It has a BTU output of 40,000 BTUs. This set features a manual safety pilot valve. The ANSI Certified G46 Burner is available with all Peterson valve controls with or without remote controls and in multiple size sets. We replaced a lesser log set with Peterson Real Fyre. Peterson looks like real wood burning and gives off way more heat than our old log set, which feels great. Peterson quality is phenomenal. Assembly was very easy. Instructions were very good. We couldn't be happier. We bought a house about 6 months ago, and the log set already in the house wasn't working right. I wanted something that was better quality and looked like real logs. I love how you can see what it will look like in your fireplace with the video. We had this log set installed awhile back and are really pleased with the choice. The look of these logs burning in our fireplace is simply beautiful. They have really added a lot to the look and feel of our living room. Love to cozy up in front and just enjoy the evenings. 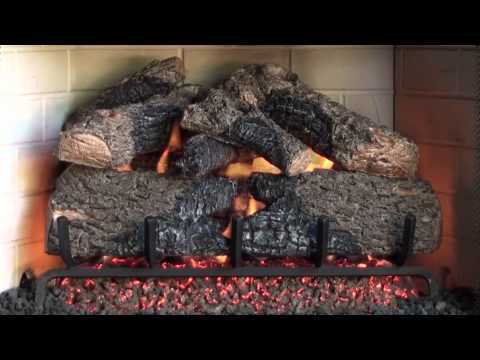 I recommend this set to anyone who has been thinking about getting gas logs for their home... you won't be disappointed! I was looking for a gas log set and came across these. They are so realistic! I grew up burning wood and these are awesome. Everyone who comes over always thinks they're real. After 10 years of burning wood we decided to change to gas logs to eliminate the smokey smell and the mess from burning wood and are very pleased that we made this change. The logs look real and it is nice that when you go to bed or leave the house all you have to do is turn it off instead of waiting for the fire to die down. These logs and the fire look 99.9% like the real thing! 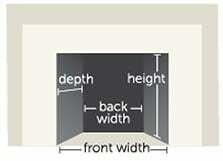 This is a great fire place set that was simple to install (Thanks to the great videos on Shopperschoice.com). It really transformed our fireplace into an attractive focual point in our home. Logs were very easy to install and the video on Peterson's web site was great. [...] Not the cheapest log set, but the best, by far. This was everything we had hoped it would be. Perfect fire, looks so real and it puts off a good deal of heat in our family room. Best of all, is no clean up and easy start. Does this product come with a remote control or blower? This particular product does not come with a remote control or blower, but can be purchased with a remote if desired.